Product #21969 | SKU AH-QU-32 | 0.0 (no ratings yet) Thanks for your rating! 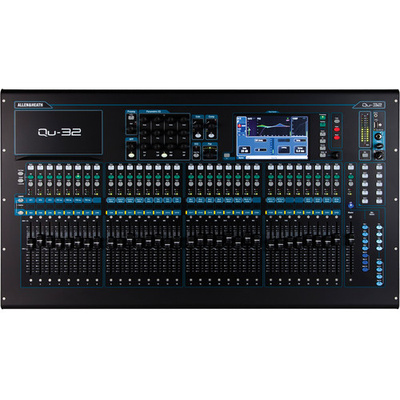 Designed to accommodate a wide variety of live sound reinforcement and recording scenarios, the Allen & Heath Qu-32 is a 38-in/28-out digital mixing console that doubles as a 32×32 USB recording interface. Featuring 32 of the company's recallable AnalogiQ microphone preamps, and powered by a 5 core ARM processor, the Qu-32 provides a variety of integrated effects and processing including channel-independent 4-band parametric EQs, compressors, delay and reverb. The mixer is compatible with both the ME Personal Mixing System and dSNAKE digital connectivity system from Allen & Heath. The Qu-32 can also be used with the Qu-Pad app, allowing you to use your iPad to mix from anywhere in the venue when connected to a wireless network. Engineered for intuitive navigation, the mixer also features a 7" touchscreen display, providing access to all settings. Furthermore, the mixer has 33 automatable, motorised faders for fast recall of levels when mixing FOH for multiple acts on the same stage, dealing with multiple monitor mixes, and similar scenarios.